With so much sensitive information residing on your smartphone, there is a chance that it knows more about you than your best friend does. That’s why your pocket-sized Android device is a dream target for cyber bad guys. Don’t put yourself at risk of being hacked – follow these 5 ultimate Android security tips right now. What else, besides accessing the Internet, do you use your Android phone for? Well, yes, calling is still a cornerstone but aside from that, there’s not so much you can do without the Internet. And yet now you can make calls online, as many instant messaging apps come equipped with this feature. Relying on mobile data to satisfy the “always online” need can be costly, so it seems wise (and practical) to hop on a wireless network whenever there’s a chance. Especially when many businesses offer Wi-Fi free of charge: coffee shops, shopping malls, airports, stations, libraries, you name it. However, nothing good comes free – public Wi-Fi networks are extremely vulnerable to hacking. So here’s the harsh truth: you are never safe when using public Wi-Fi. Cybercriminals have their own methods to steal your private data while you’re innocently posting a status update on Facebook or buying that camera on sale while sipping your latte. The most common tactics are man-in-the-middle attacks, fake hotspots and Wi-Fi sniffing. An unsecured Wi-Fi network isn’t too challenging to crack even for an amateur hacker, so you might end up giving away your banking details, passwords, personal files and other sensitive information in a blink. For this reason, a VPN app is a must-have for your Android device. VPN stands for a virtual private network. It saves the day by making your online traffic snoop-proof through tough encryption. The most exciting part is that you can use public Wi-Fi for anything you want without getting paranoid about your personal info being stolen. To get the Internet privacy you deserve, choose a trustworthy VPN app that keeps no logs, is easy to use but carries advanced security features under the hood, such as the NordVPN app for Android. It also offers the functionality of automatic VPN connection on Wi-Fi networks, which makes security on wireless networks effortless. 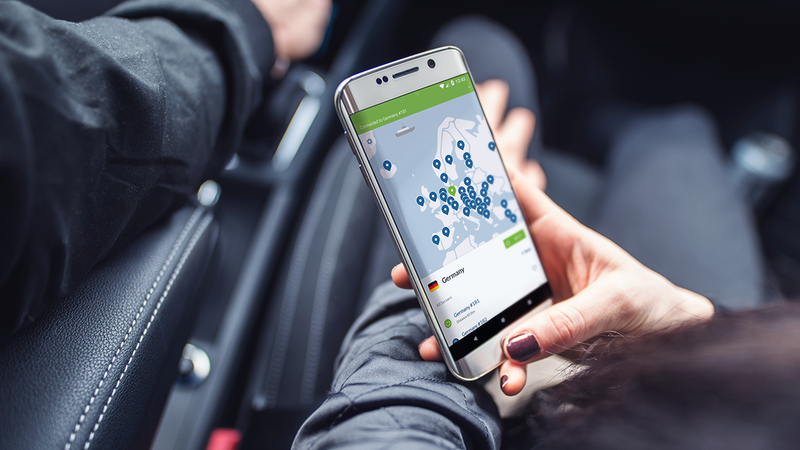 The NordVPN app comes with a 7-day free trial, so simply give it a try now. Installing apps from unofficial sources is risky, as you can easily get malware slipped into your device. In the Android world, downloading apps from anywhere but the Play Store is called “sideloading” and is implemented by installing application package files in the APK format. Again, by doing so, you can’t be sure if the file isn’t malicious or if it’s set to serve the intended purpose. To always stay on the safe side, make the Google Play Store your go-to place for getting apps. Google applies a strict screening and reviewing process for submitted apps, and only credible ones should make it to the Play Store. Nevertheless, hackers persistently try to push their malicious apps into the official app store and sometimes they succeed. In 2017, Google took down 700,000 dodgy apps from the Play Store and announced of its improved models of detecting abusive developers. By default, Android has the sideloading option disabled. In case you have this security setting changed, you can manage it by going to Settings > Advanced Settings > Security > Unknown sources. Here’s one more advantage of getting apps from the Play Store: you can review the permissions required by an app before you download it. So never skip this step and dedicate a few seconds to take a look whether there’s nothing oddly unusual before hitting the “install” button. At first glance, some of the required permissions may look unrelated, for example, access to your camera for an instant messaging app. But the reason behind this can be completely legitimate – to send pictures, videos or make video calls. However, if a flashlight app requires access to your contacts, it’s an alarming signal of malicious intents. In such a case, don’t download the app. Android allows you to manage app permissions after installing. To do this, go to Settings > Apps > (Select an app) > Permissions. Also, if an app needs to use something you didn’t allow access to, you will be prompted to choose whether to give that permission or not. Many cool app features are tied to location services. However, location data is of the most intimate bits of data you can share, so think twice whether certain functionalities are worth giving up your privacy. There are apps that are completely location-based, for example, Google Maps. On the other hand, some apps may use your location to track you and create your data profile without you even knowing. Select the location mode that feels right for you by navigating to Settings > Advanced Settings > Location access. In the same section, you will be able to disable location access completely. On Android 6.0 and above, you can enable or disable location access per app. So if you’ve noticed that your flashlight app (oh, those flashlights!) is using your location for an unknown reason, head to Settings > Apps > (Select an app) > Permissions and disable the location access. It’s the shortest tip yet the key one! Android updates bring you not only new features but bug fixes and patches for security vulnerabilities as well. That’s why you should never skip these. The same rule applies to your installed applications. The easiest way to always stay on top of the security game is to enable automatic updates over Wi-Fi. To do so, go to Google Play Settings > General > Auto-update apps.